Imagine a landscape you can hold in your hands and change at will – sculpting topography and directing water flow to solve land-management problems ranging from erosion to wildfire management to national park accessibility. Helena Mitasova is a professor of marine, earth and atmospheric sciences at NC State and associate director of geovisualization in the Center for Geospatial Analytics. Thanks to her work on the Tangible Landscape project, researchers, urban planners, ecologists and anyone involved in managing the land can get real-time feedback about how their projects might affect landscape processes. How does Tangible Landscape work? Pick an area of interest: your neighborhood, fields draining into a stream or a barrier island on the coast of North Carolina, for example. 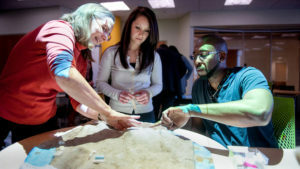 Utilizing spatial data from that location, Tangible Landscape helps you to create a three-dimensional scale model of it using kinetic sand – yes, the same kind of sand you see advertised to children on TV. An aerial photo of the same location is projected onto the finished physical model and a 3-D scanner registers any changes made to the model, feeding them into a geospatial simulation program. The simulations can represent water flow, storm surge flooding, solar energy potential or other landscape processes. This continuous information feedback loop allows the user to shape or change various features on the model and see the effects in real time. “We’ve developed Tangible Landscape applications that allow users to evaluate the impacts of construction on erosion and stormwater runoff, explore ways to protect coastal homes from storm surge flooding, design nature trails with low ecological impact, control wildfire spread or explore scenarios for treatment of sudden oak death in Northern California,” Mitasova said. Mitasova and Ph.D. students Anna Petrasova, Brendan Harmon and Vaclav Petras developed Tangible Landscape utilizing GRASS GIS, an open-source geospatial information software package originally developed by the U.S. Army Construction Engineering Laboratories, currently used by researchers and practitioners globally and supported by an international development team. This post was originally published in College of Sciences News. A new, open-source software package created by researchers at NC State and Stanford could help reduce contamination in microbial samples. Nathan Crook and Manuel Kleiner recently received funding from the Plant Soil Microbial Community Consortium (PSMCC). Crook and Kleiner are members of the Microbiomes and Complex Microbial Communities cluster in NC State’s Chancellor’s Faculty Excellence Program.